Today is an easy ride. I am only riding 110 miles. I am riding to my sister Edna Jean’s to spend the night and visit and catch up on what has happened with her and her family. There are no stops at any historic sites today just riding through nice coastal scenery. I have another cool, clear sky riding day today. It’s been a very long time since I’ve come this way so I was taking it slow and easy allowing me to take it all in and remember the many days gone by. Leaving West Columbia, my ride today will take me down Hwy. 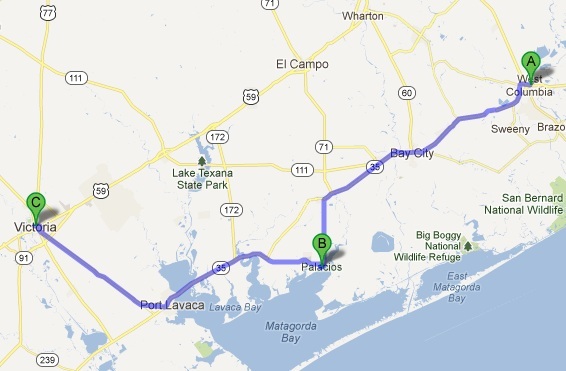 35 through Bay City, Palacios to Port Lavaca where I pick up Hwy 87 to Victoria. I must say my ride through Palacios was the highlight of the ride. 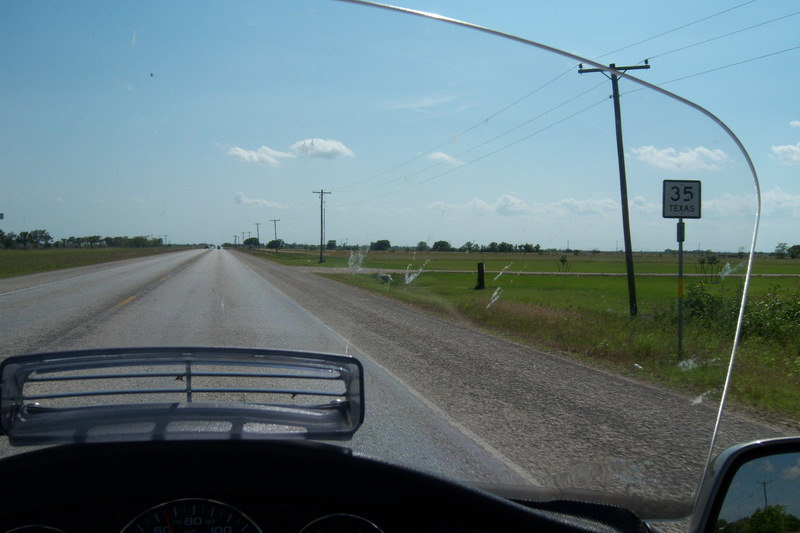 As you ride into Palacios from the east on Highway 35 it takes a sharp right. If you look to the right you have a good view of Tres Palacios Bay. When I saw the bay I continued on to East Bay Blvd to a boat ramp. I parked to stretch my legs and take in the view and enjoy the nice breeze coming off the bay. It was nice walking around the pier watching the fish jump and Seagulls hovering looking for their next meal. Palacios (Spanish for palace) is midway between Galveston and Corpus Christi. 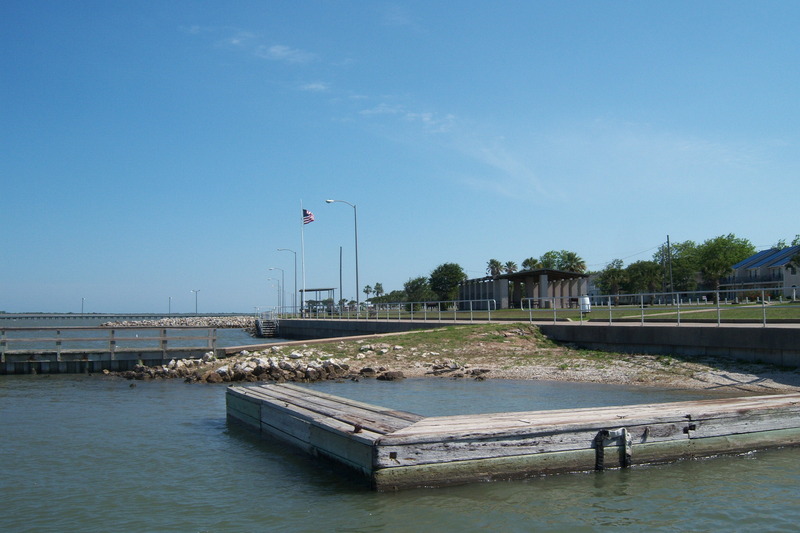 Palacios is a small town of 5,000 and is the Shrimp Capital of Texas. I love small towns and this is another good little town. 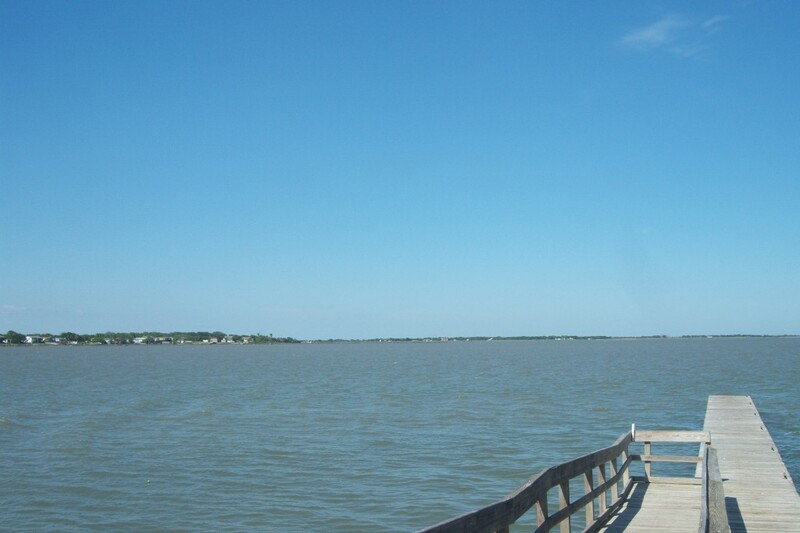 Palacios is a favorite for tourists from all over who enjoy its palm-tree lined bay front, parks, fishing and boating as well as its year-round beautiful, mild weather and it is a favorite with birdwatchers. A seawall walkway is a great place for a stroll; the adjoining fishing piers offer a good spot for fishermen to try their skills. There is a beach area for swimming and for sunbathing. There is a lot of lodging in and around Palacios, so I may have to come back and spend some leisure time here away from all the hustle and bustle. After 30 minutes or so I was back on the road. My rides across Carancahua and Lavaca Bays gave nice views from the bridges. Views from the Lavaca Bay Bridge are exceptional. I got to my sister’s around 5:30 and spent the rest of the day visiting and catching up. See more pictures from the ride here. You can see the monument for miles before you actually get there. It is an impressive sight. There is no charge for the monument unless you want to see the view from atop the monument. 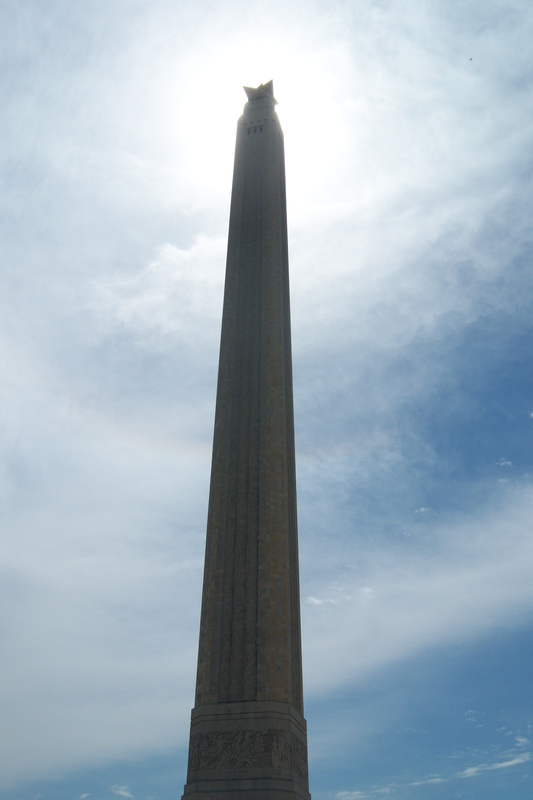 You take the elevator up to the Monument’s Observation floor, 489 feet above the Battleground. 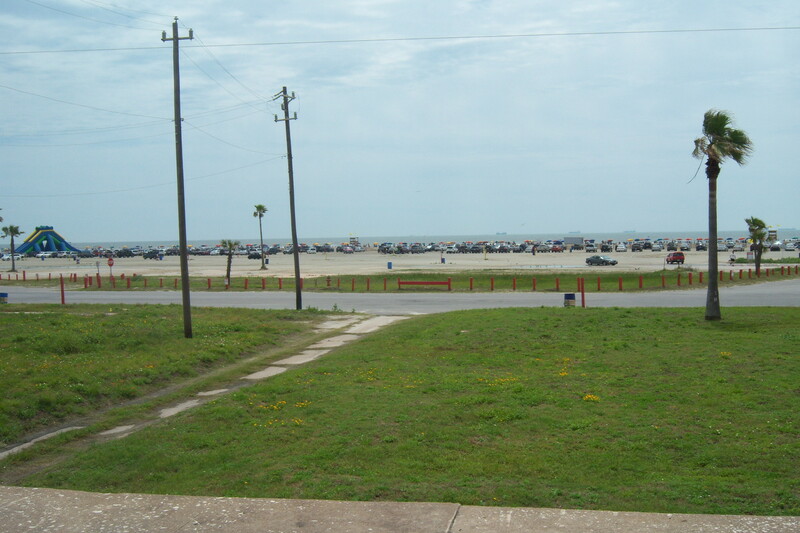 Once at the top you will have a beautiful view of the city, Houston Ship Channel, harbor and surrounding area. The San Jacinto Museum of History is housed in the base of the San Jacinto Monument and has priceless artifacts, dioramas, 250,000 documents and 40,000 books chronicling more than 400 years of early Texas history. Walking the Battleground there are granite markers designating locations of the Texian camps, the Mexican camps, the advance by Texian forces and other information about the battle. If you are not a Texan you may be asking yourself… “What’s the big deal?” Well… the Texans had lost the battles of the Alamo and Goliad. The men at those locations fought a fierce fight and died horrific deaths for what they believed. Santa Anna thought he had it all wrapped up except for finishing off Sam Houston and his men… few in numbers and corner at San Jacinto. Two of the plaques on the on the monument sums it up best. With the battle cry, “Remember the Alamo! Remember Goliad!” The Texans charged. The enemy, taken by surprise rallied for a few minutes then fled in disorder. The Texans ask no quarter and gave none. The slaughter was appalling, victory complete and Texas free! On the following day General Antonio Lopez De Santa Anna self-styled “Napoleon of the West” received from a generous foe the mercy he had denied Travis at the Alamo and Fannin at Goliad. Measure by its results, San Jacinto was one of the decisive battles of the world. 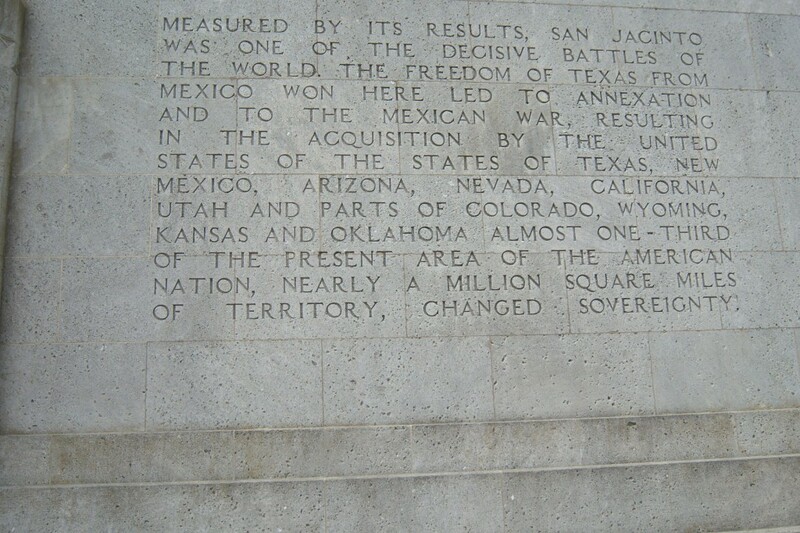 The freedom of Texas from Mexico won here lead to the annexation and the Mexican War, resulting in the acquisition by the United States of the states of Texas, New Mexico, Arizona, Nevada, California, Utah and parts of Colorado, Wyoming, Kansas and Oklahoma almost one third of the present area of the American Nation, nearly a million square miles of territory changed sovereignty. The fight lasted just 18 minutes. About 630 Mexican soldiers were killed and 730 captured, while only 9 Texans died. Santa Anna fled the battle disguised as an enlisted man. Santa Anna was captured the following day and held as a prisoner of war. Three weeks later, he signed the peace treaty that paved the way for the Republic of Texas to become an independent country. So this is a big deal for us Texans and we are proud of our history and culture. All the historic sites of the “Texas Independence Trail” help remind us of where we have come and help us to be mindful of our responsibility to our past and future generations. For more on the battle click here ( http://www.tshaonline.org/handbook/online/articles/qes04 ). While at the San Jacinto Battleground and Monument you may want to spend some time at the Battleship Texas, located just across Battlefield Road. You can see the battleship when looking down the reflective pool from the monument. The admission fee is $12 for everyone 13 years old and older. The tour is self guided and there is a lot of history to be seen about the battleship and World War II. The rest of the ride was very enjoyable. By now it was overcast and it was in the low 80’s. 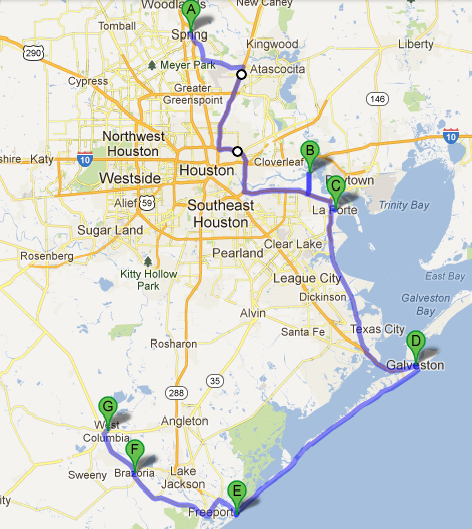 From San Jacinto I rode to La Porte and rode down Hwy 146 to Galveston. 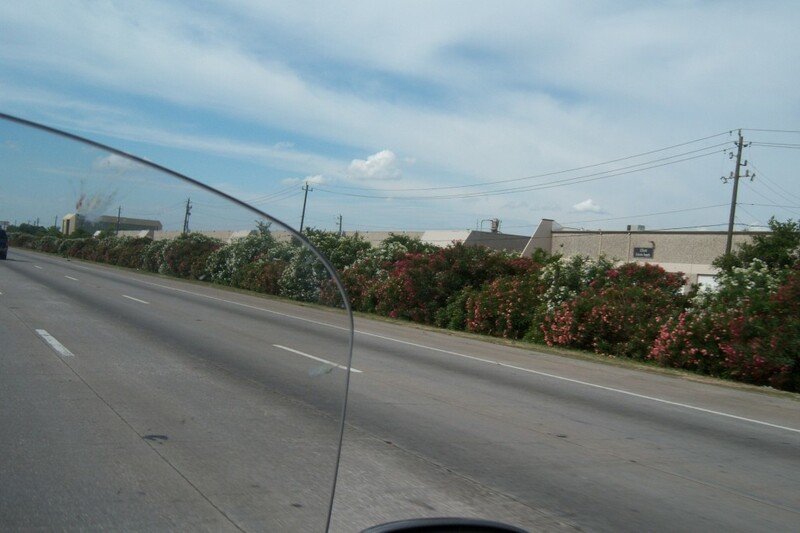 Hwy 146 parallels Galveston Bay with many nice views of the bay all along the way. 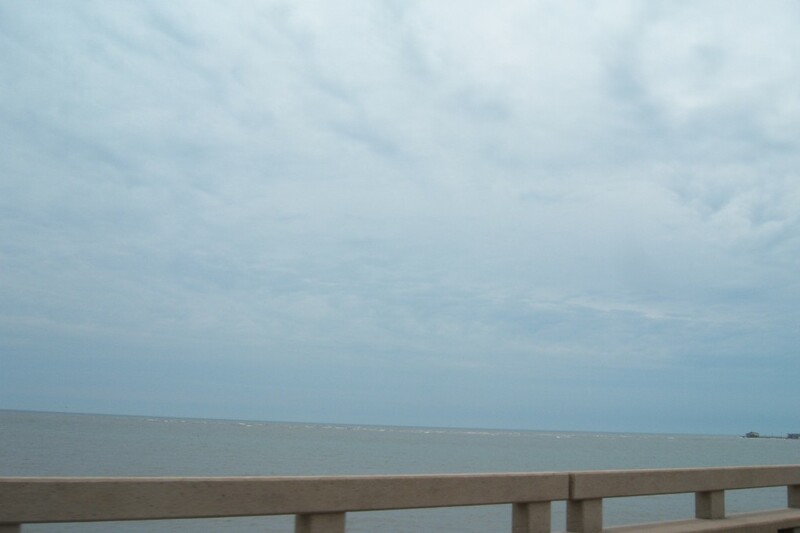 When I got to Galveston I rode Seawall Blvd. 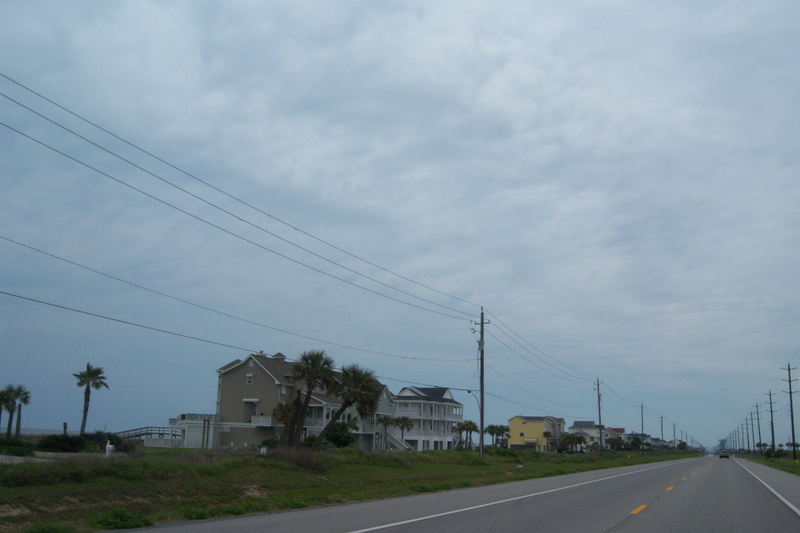 to the northeast end of the island before turning around and heading southwest to Surfside. There was lots of swimmers on the beach today and traffic on Seawall Blvd. was rather heavy. I rode to Surfside via Seawall Blvd., San Louis Pass Rd., and Bluewater Hwy. There is a toll ($2) bridge where San Louis Pass Rd. ends and where Bluewater Hwy starts. Because I forgot the GPS was set to avoid toll roads, it kept trying to route me around this bridge. I forgot about the toll bridge and was a bit annoyed with the GPS… again… When I got to the bridge I realized what my problem was. This leg of my ride was a nice leisurely ride with cool sea breezes, over cast skies and great beach views along the way. At Freeport I picked up Hwy 36 and rode to West Columbia my final destination for the day. West Columbia is my hometown and was the “First Capitol of Texas”. Around 1833 Leman Kelsey built a story and a half structure. 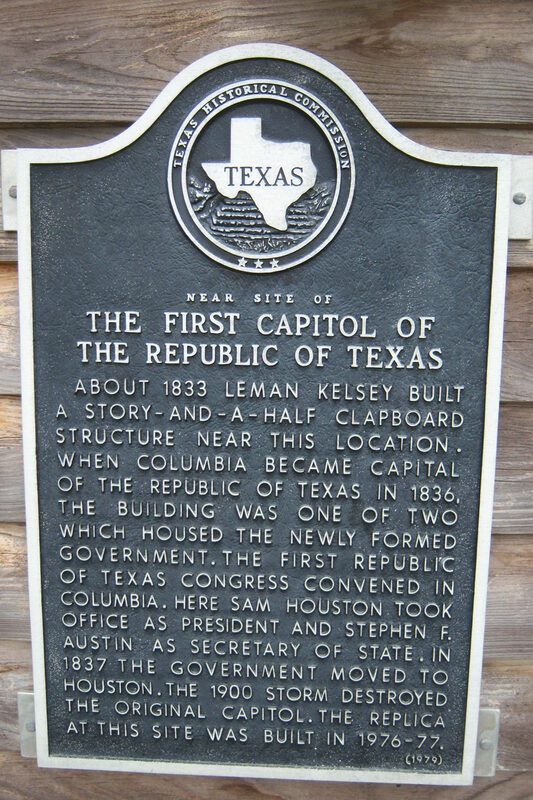 In 1836 West Columbia then known as Columbia became the first capital of the Republic of Texas and this building was one of two that housed the new government of the Republic of Texas. The Congress convened here and Sam Houston took the office as President and Stephen F. Austin as Secretary of State. In 1837, the government moved to the new city of Houston. The 1900 storm destroyed the original capital. A Replica was built at this site in 1976-77. 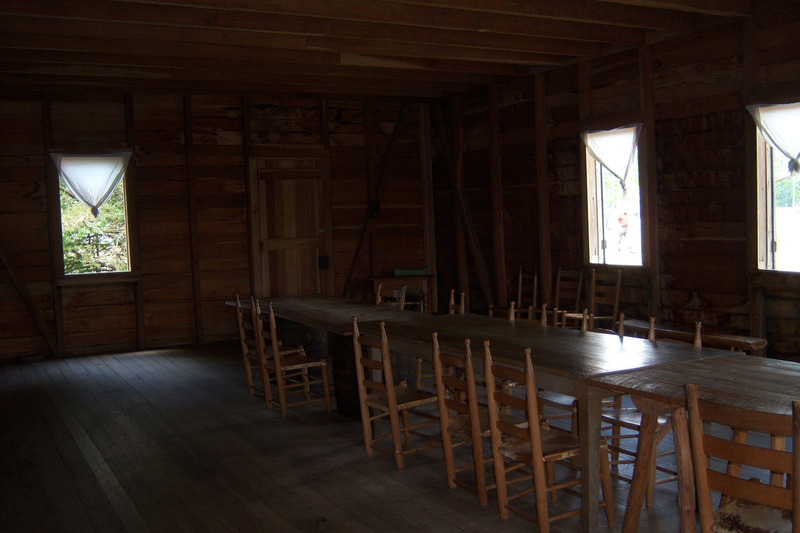 The replica depicts how the interior and exterior looked during 1836. 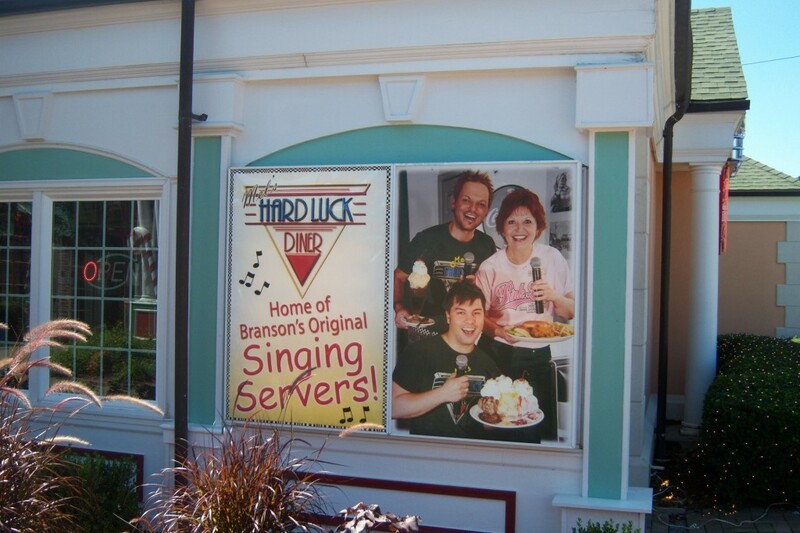 Much of my family still lives in the area. When I say much I mean much… I have over 40 first cousins and many aunts, uncles and second and third cousins! I will be staying with my brother Gary and his wife Ginny tonight. 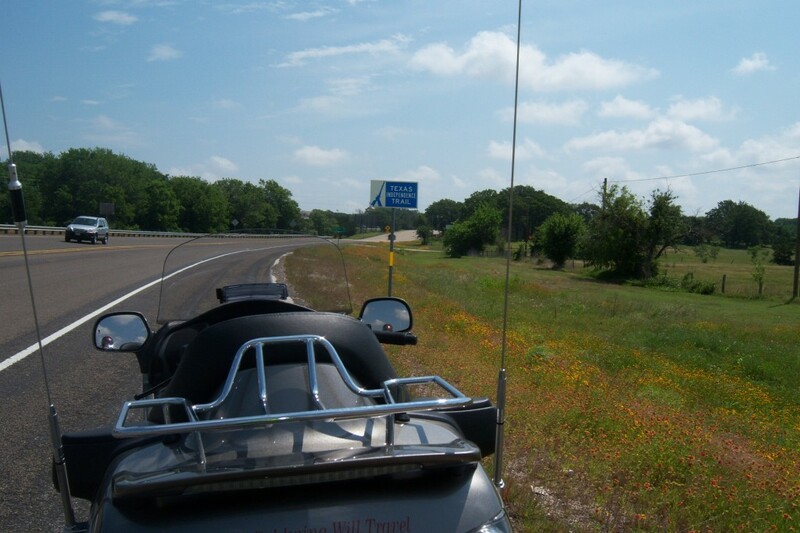 After seeing an article in the “Texas Highways” magazine about the “Texas Independence Trail” I thought it would be a good motorcycle ride. I have seen the road signs in the past many times but hadn’t given it much thought until seeing this article. The Texas Historical Commission has charted out a good motorcycle adventure with its delineation of the Texas Independence Trail region. 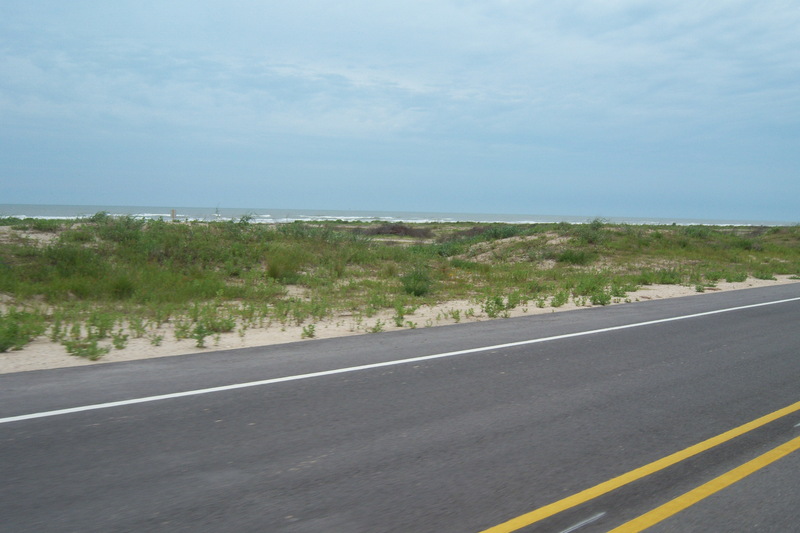 The trail is an area that winds through the Houston/Galveston area following the coast to West Columbia and Victoria. 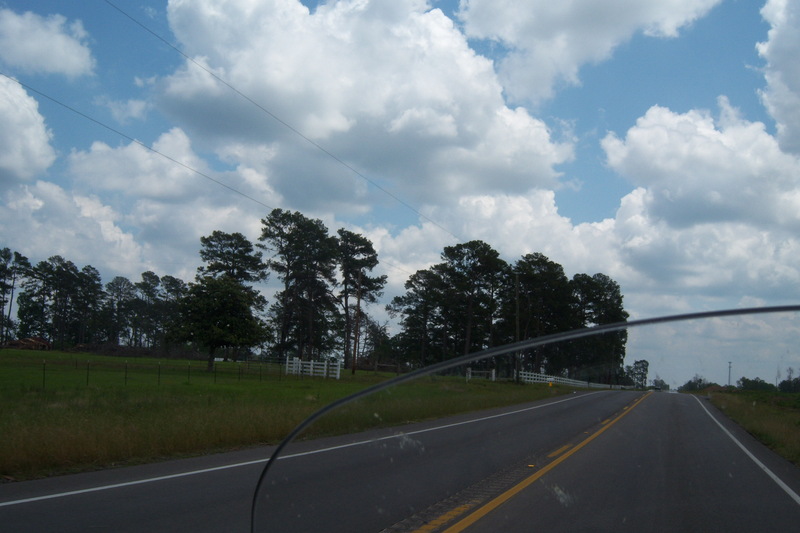 The trail then continues on to Goliad, San Antonio, Gonzales, Bastrop and Brenham. 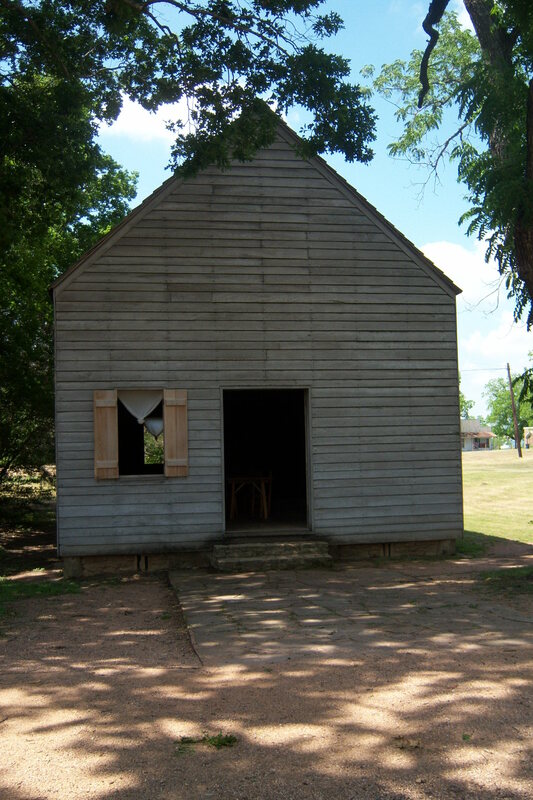 All along the trail are sites rich in Texas Independence history and much more. 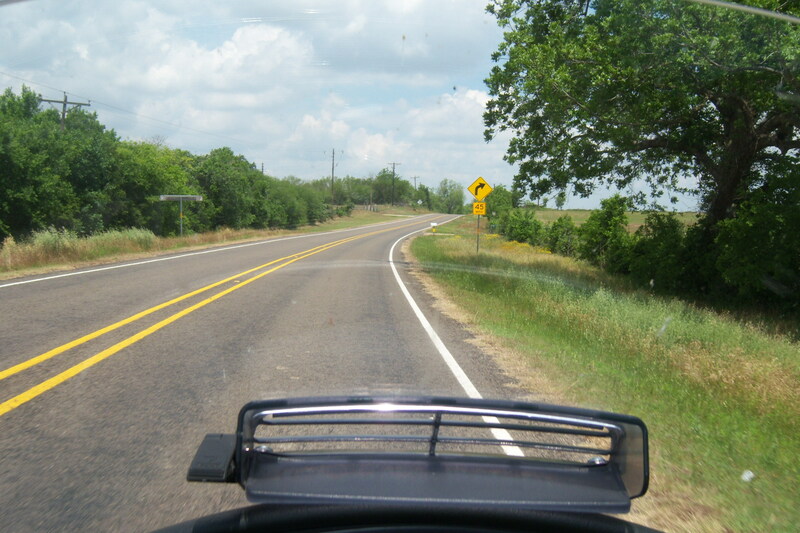 Texas Independence Trail road signs. December 1821: Stephen F. Austin settles the first 300 Anglo families in Texas. April 1834: Santa Anna takes control of Mexico and repeals Constitution of 1824. October 2, 1835: The first military engagement of the Texas Revolution. February 22/24 1836: Santa Anna attacks the Alamo. 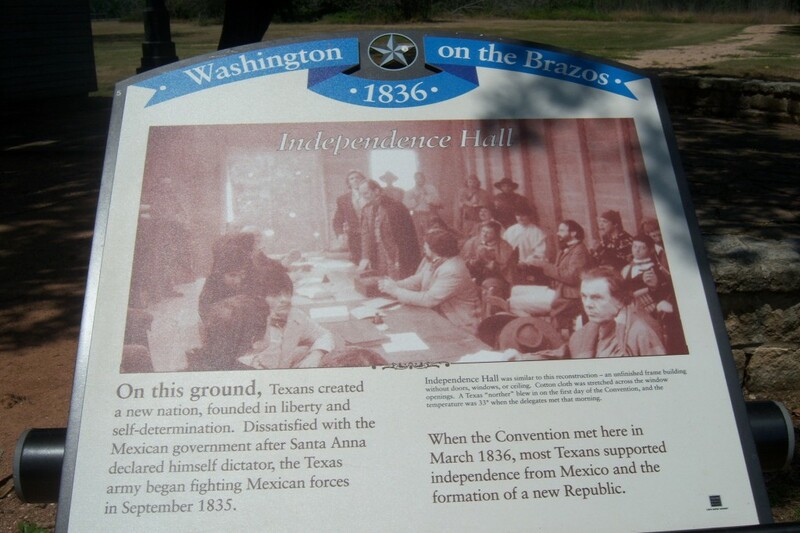 March 2, 1836: Texian delegates (comprised of Anglo and Mexican) gather at Washington on the Brazos to sign a declaration of independence and create a government. March 6, 1836: The Alamo falls to Santa Anna and the Mexican Army. 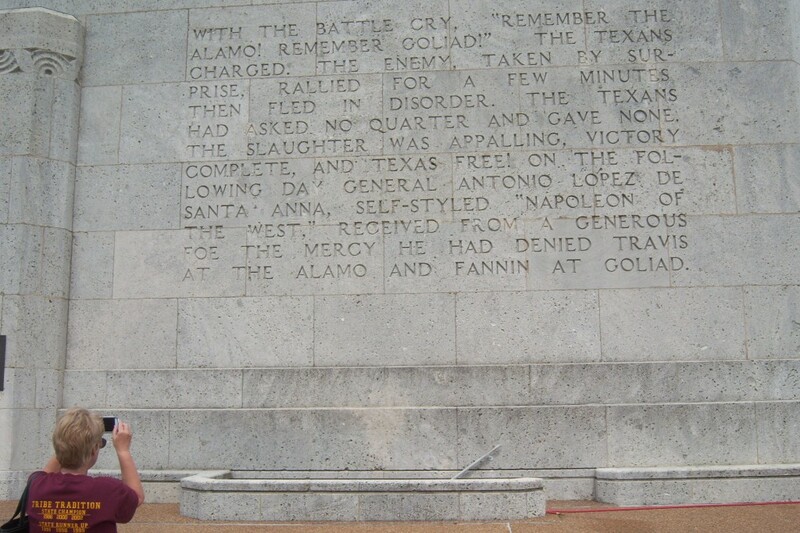 March 27, 1836: Col. Fannin and his men are massacred at Goliad. April 21, 1836: General Sam Houston and the Texas Army defeat Santa Anna at San Jacinto. October 1836: The first permanent government of the Republic was elected under President Sam Houston, and met at Columbia in the fall of 1836. 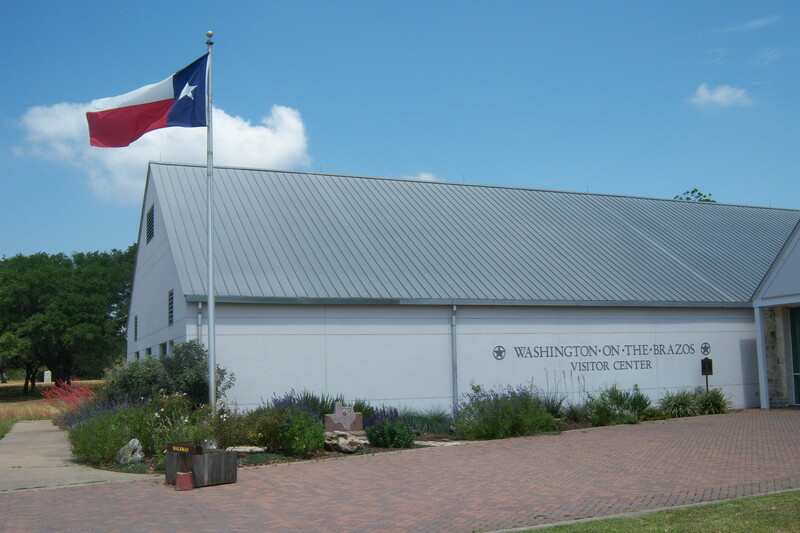 Washington on the Brazos: Site where Texas declared its independence. 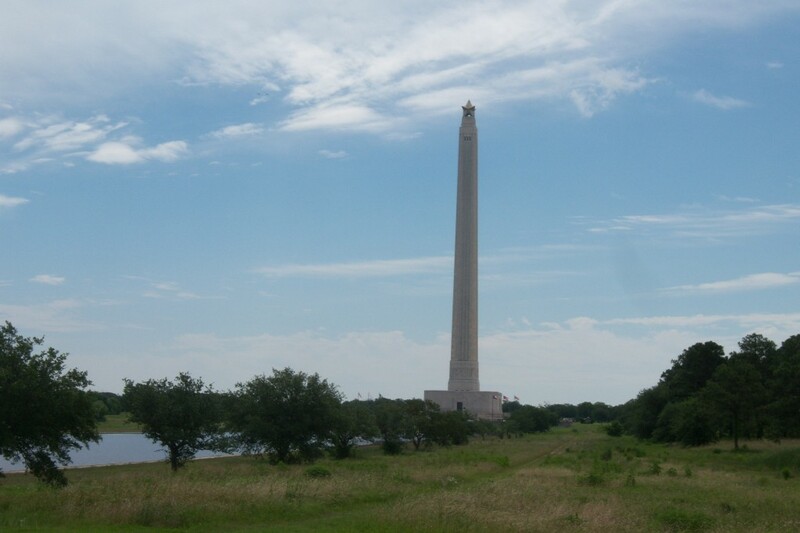 San Jacinto Battleground: The battle that won Texas its independence. Goliad: Fannin Battleground and graves of Fannin and his men. San Antonio: The heroic battle of Alamo. Janet was in San Diego so she wasn’t able to go on the ride. My cousin W. D. was going but at the last minute he had to put his scooter in the shop and he is waiting on a part. I thought about not doing the ride. I decided if I was going I needed to leave the next day. Late that night, I packed everything and loaded the saddle bags to leave the next morning and hoped I hadn’t forgotten something. When I left the weather was perfect, 66 degrees and partly cloudy. I headed out and was about 20 miles from home when I realized… I had left the camera! I had to have the camera… so back home I went. I lost about an hour but I had lots of daylight left. The total mileage for today was 198 miles, excluding the miles for going back home for the camera. 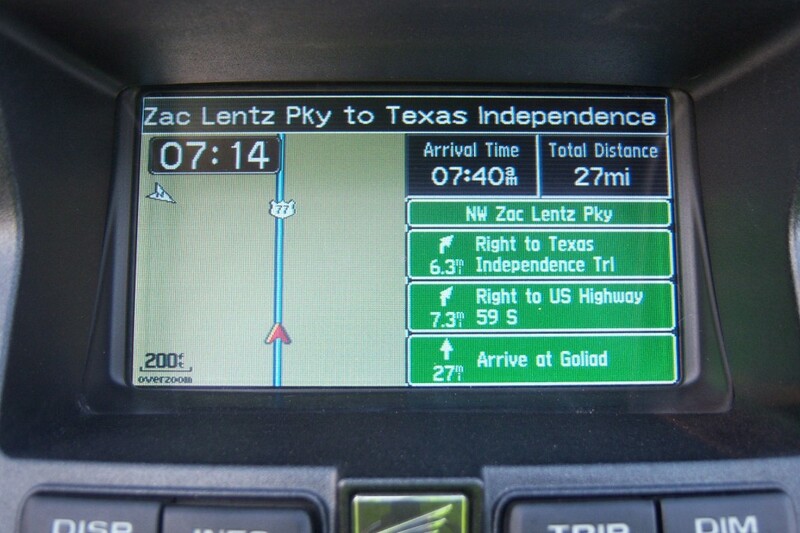 My first and only stop today is Washington on the Brazos the site of Texas declaring its independence from Mexico. The ride to Washington on the Brazos was a good one. The spring wildflowers were still blooming and added a splash of color to the green from the recent rains. Along my route were many gentle hills covered in trees and open pasture areas. There were some nice gentle curves along the way, too. It was a cool ride both figuratively and literally. 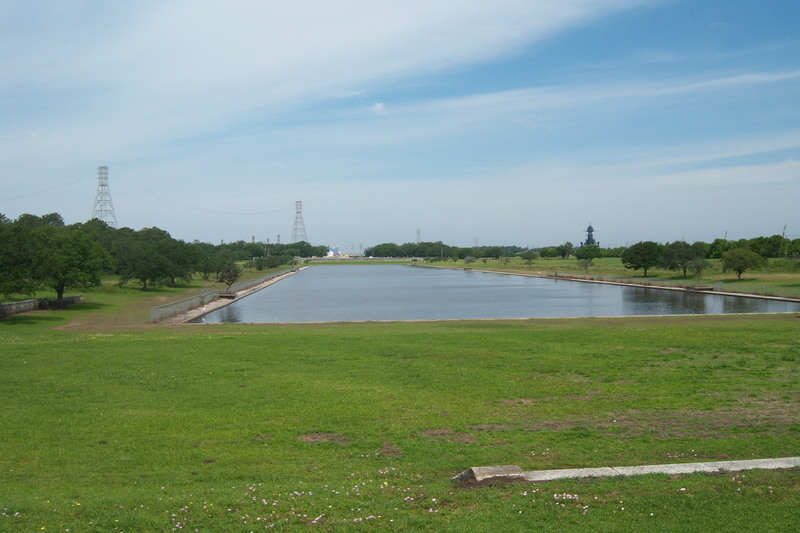 Washington on the Brazos, the birth place of Texas, is now a state park. You can walk the grounds where there are markers telling what was where at the time. Everything is free unless you want to take one of the guided tours or tour the new “The Star of the Republic” museum. The museum is administered by Blinn College. 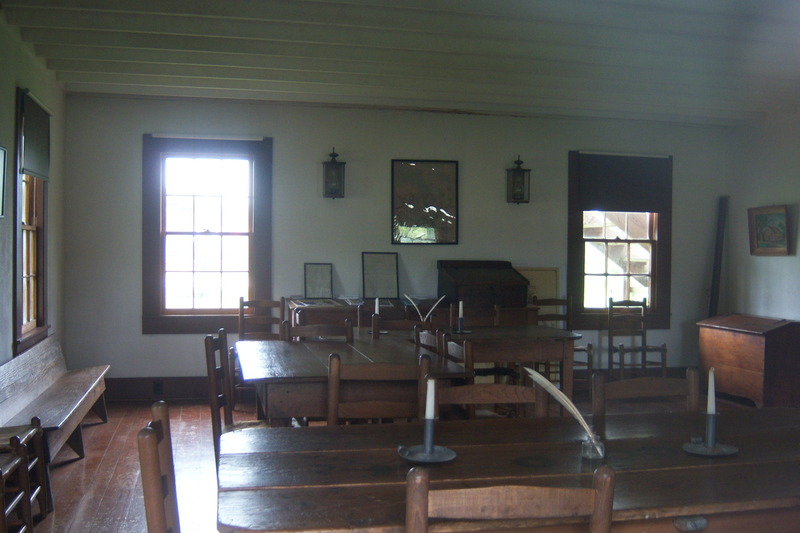 Independence Hall is revered as one of Texas’ most significant historic places. 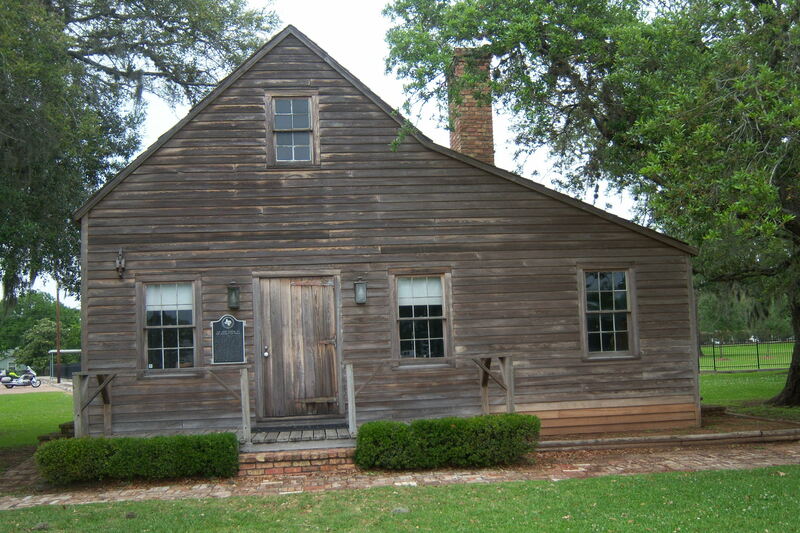 The original building burned sometime around the turn of the century but a replica of Independence Hall marks the place where the Texas Declaration of Independence was signed and the government of the Republic of Texas was created.